Ours of this Place begins to answer the Ends of its being first let up, the Poor having a much more comfortable Subsistence, and the Parish being greatly relieved of its former Burthen; we are dirceted in regulating our House by the best Rules we can pick out of the Account of Workhouses lately printed. In general, we have reason to hope the Benefits of it will more and more appear, every Year, both to the Poor and ourselves. 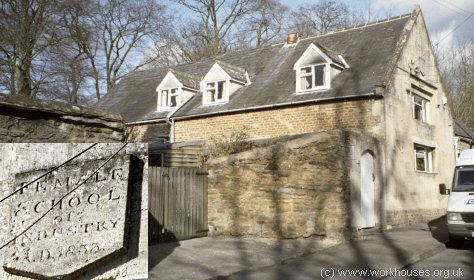 Buckland opened a workhouse in around 1739 (Thomas, 1971). In around 1801, Faringdon erected a new workhouse under the terms of Gilbert's Act of 1782. By 1832, the poor were being "farmed" by a contractor. For an annual fee of £2,200 he operated the workhouse and provided each inmate with "good meat dinners three days at the least in each week" and "mutton or such other diet as may be suitable" for any that were sick. A regime of hard labour and strict discipline prevailed. Faringdon was also the location of a Female School of Industry — such establishments provided pauper children with training, mostly in domestic and agricultural skills. The building dates from 1833 and was located on London Street (see map). The large part of the building still survives as a private house. Faringdon Female School of Industry, 2000. Berkshire: Ashbury, Baulking, Bourton, Buckland (2), Buscot, Charney (Bassett), Coleshill, Compton and Knighton, Great Coxwell, Little Coxwell, Eaton Hastings, Great Faringdon (4), Little Faringdon, Fernham, Hatford, Hinton (Waldrist), Kingston Lisle and Fawler, Langford, Longcott, Longworth, Pusey, Shellingford, Shrivenham, Stanford (in the Vale), Uffington, Watchfield, Woolstone. Gloucestershire: Later addition — Lechlade (from 25th January 1836). The population falling within the Union at the 1831 census had been 12,992 with an average (1832-35) poor-rate expenditure of £11,914. The original union workhouse was an adaptation of the existing workhouse building for which the Poor Law Commissioners eventually authorised the sum of £1500. I found there a large workhouse, already erected, capable of holding three hundred persons; it belonged exclusively to Faringdon, and was used by that parish alone. At the time of my visiting the place, it contained sixty-three inmates. Order and regularity were kept up to a high degree in this workhouse; the classification of the inmates, and the separation of the sexes, have been rigidly enforced; and the able-bodied paupers were employed in digging stone out of a pit, which was situated on a piece of land attached to the workhouse. The parish was, notwithstanding, most heavily burdened with poor-rate. I united twenty-nine parishes to Faringdon, under order of the Board of Poor Law Commissioners, dated February 2nd, 1835, many of which were highly pauperized. They have all derived benefit from that which, under the feeble administration of the parish vestry, had been useless to Faringdon alone. Although the interior arrangements of the workhouse were not such as to render the management so efficient as it will be when the alterations now in progress, and which are estimated to cost 900l., are completed, yet they were sufficient to make it immediately available for the reception of the paupers of the whole union. The board of guardians have therefore, with the able, energetic, and most valuable co-operation of their chairman, Viscount Barrington, carried out the principles of the Poor Law Amendment Act to a greater extent than in any union within my district, and the results have been satisfactory in the highest degree. All out-door relief to able-bodied labourers is discontinued. The workhouse now contains seventy-four inmates from the whole union, being only eleven more than from the parish of Faringdon alone, under the old system. Of the first eighty-seven labourers with families, to whom out-door relief was refused in the months of February and March, and most of whom had been constant hangers on the parish fund, and to all of whom an order for the workhouse was given for themselves and their families, not one-half availed themselves of the offer, but immediately found means of providing themselves. Of the rest who successively accepted the proffered assistance, some staid one day, some two, some three, and, excepting two, none remained more than four days. Being anxious to ascertain whether the application of this principle had inflicted hardship upon these men and their families, and whether the denial of out-door relief had driven them from their own villages to seek an uncertain subsistence elsewhere, I devoted several days, in the parishes to which they belonged, to the purpose of ascertaining their real situations, by visiting them at their own homes, I found that, of the 85 men, 78 were at work in their respective parishes, and two others in the immediate vicinity, and not one of them had his dwelling broken up. Thus were 85 men with their families at once relieved from the degradation of pauperism, and by being thrown upon their own resources, taught that they could honestly and independently support themselves and their families by their industry; most of them had at that season been upon the parish books for three years. The main building was an unusual U-shaped layout, three storeys in height. The area within the U was divided into four walled exercise yards for the different classes of workhouse inmate. A single-storey entrance block fronted onto Union Street at the north of the site, with a chapel located at the west side. A workshouse school was located at the far south of the site. 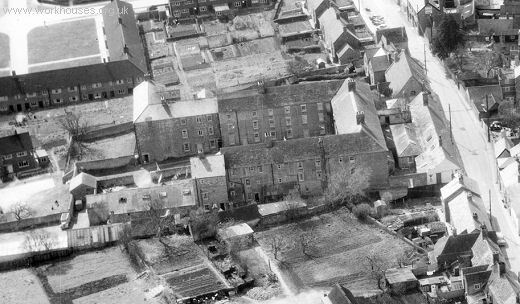 Faringdon workhouse aerial view from the east. After 1930, the former workhouse building was converted into flats which continued in use until the late 1960s. No trace of the workhouse now remains. The site has been redeveloped to provide accommodation for the elderly known as Brackendale. Berkshire Record Office, Berkshire Record Office, 9 Coley Avenue, Reading, Berks RG1 6AF. Holdings include: Guardians' minute books (1835-1930); Births (1835-32); Baptisms (1927-33); Deaths (1875-1933); Assessment Committee minutes (1862-1912); etc.